This week I was featured in Thom Gibson’s podcast “Storytelling in the Classroom” along with friend and storyteller Jeni Bonaldo. I discuss the ways I integrate storytelling into my school day, and both Jeni and podcast host Thom Gibson tell stories to their students, and I offer a critique of both. On episode #31 of the Speak Up Storytelling podcast, Elysha Dicks and I talk storytelling! 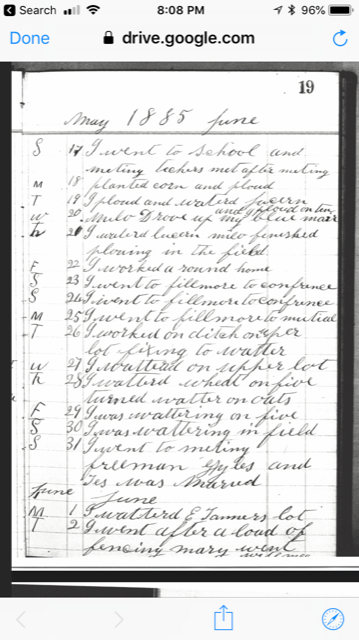 In our followup segment, we talk about two emails received related to Homework for Life, including a sample of Homework for Life from the 1800's! Next, we talk about finding and collecting stories in your everyday life using "Homework for Life." We talk about the value of waiting to tell a story, the possibility that you are in the midst of a story, and the way that some stories can stretch across decades. Next we listen to David Ring's story about a trial, a possible death penalty, and a hit ordered on his life. Next, we answer questions about using Homework for Life to recapture recorded memories and the differences between personal narrative storytelling and the telling of folktales, fables, fiction, or informational text. On episode #30 of the Speak Up Storytelling podcast, Elysha Dicks and I talk storytelling! In our followup segment, we talk about upcoming dates (including a workshop in Seattle this summer) and my weekly storytelling newsletter. Next, we talk about finding and collecting stories in your everyday life using "Homework for Life." We talk about fusing a moment of realization onto an ongoing experience to illustrate that realization clearly for an audience. Essentially to create a story. Next we listen to Chuck Fedolfi's story about his dog, Boo, and the inspiration derived from Boo's struggle. Next, we answer questions about the difference between telling stories formally and informally, the ways that my Homework for Life spreadsheet is structured, and the writing of effective storytelling pitches. On episode #29 of the Speak Up Storytelling podcast, Matthew and Elysha Dicks talk storytelling! In our followup segment, we talk about an error in a previous podcast, upcoming show and workshop dates (including a workshop in Seattle this summer), a Pulp Fiction secret revealed, and more. Next, we talk about finding and collecting stories in your everyday life using "Homework for Life." We talk about the C-A-B-C format for storytelling and how it can be applied to a simple moment with a father and son. Next we listen to Christina Fedolfi's story about mishaps and adventures while preparing for a big bike race. Next, we answer questions about storytelling and Homework for Life with children, the gender gap in storytelling, and remembering the details in Homework for Life for the future. On episode #28 of the Speak Up Storytelling podcast, Matthew and Elysha Dicks talk storytelling! In our followup segment, we talk about upcoming Speak Up events, offer insight on Tasmanian Devils, respond to some listener emails about PTSD, and apologize for failing to record a new episode last week. Next, we talk about finding and collecting stories in your everyday life using "Homework for Life." We talk about the value of finding "worsts" in your life, then we talk about how to apply perspective to your Homework for Life in an effort to find more stories. Next we listen to Erica Donahue's story about attending college in rural Virginia as a fish out of water. Next, we answer questions about effective transitions and how and when to tell stories involving trauma. Back in May of this year, Elysha and I launched Speak Up Storytelling, a podcast about telling your best stories. Each week we teach strategies for finding, crafting, and telling stories. We also play a story previously told at a Speak Up event and use that story to teach lessons about what the storyteller has done well and what might be improved for next time. Our goal was to produce at least 25 episodes in 2018. This week we published #24 and will be recording #25. But in addition to sending 24 podcast episodes into the world and garnering thousands of listeners, amazing connections have been made. A woman in Brisbane, Australia who’s read my book and listens to the podcast with friends who has been inspired to launch her own storytelling show in January. A teacher in Chicago who is using my book and our podcast as part of her spring curriculum. Two different podcast listeners in the Seattle area who have each shared some remarkable ideas and bits of art with me. Just this morning a listener in Maine who hit her 100 days using my Homework for Life strategy. Find a way to put your voice out into the world. Find a way to take your passion and turn it into something that reaches beyond the cozy confines of your home. Whether it’s a podcast or a blog or YouTube or Instagram, find a way to bring your expertise and your joy to the masses. The potential returns are immeasurable. We’re so fortunate to live in a time when each one of us can be writers and broadcasters with the potential for reaching millions of people. Less than two decades ago, gatekeepers kept the vast majority of human beings silenced. Reaching a large audience required enormous sums of money, technical expertise, years spent climbing the ladder and paying your dues, and access to networks controlled by a small number of businesspeople. Today you can reach the world with an Internet connection and a phone. A laptop and a microphone. We forget how lucky we are. Once a week, we sit at the dining room table with about $200 worth of audio equipment and a laptop and try to record a podcast as phones ring, children who are supposed to be in bed interrupt us, and cats knock over microphones. And our audience isn’t very large yet. We are finding listeners slowly, primarily in the United States but also in 49 other countries worldwide. But relatively speaking, the audience is small but growing. But when you receive an email from someone on the other side of the world explaining how your words are changing their life and the lives of others for the better, it doesn’t matter how many people are listening. Just those few would be enough. So find a way to put yourself into the world. Take the thing that you do well and find a way to share it with others. A photo of your garden. A blog post about the lesson plan that went especially well. A YouTube video on the booties that you’re knitting. A podcast of your cringe-worthy high school poetry. A Twitter account specializing in your accounting best practices. You have something to share. Find a way to share it. You never know what might happen. Episode #22 of the Speak Up Storytelling podcast is now available for your listening pleasure. On this week’s episode, Elysha Dicks and I talk about finding excellent stories in your everyday life using my strategy "Homework for Life." We discuss how a moment can not only be storyworthy for the stage but might be useful in many other contexts in life. Next, we break format. Rather than listening to a story and critiquing, we decided to clear out the mailbox by dedicating this episode to listener questions. Then we end the podcast from a remarkable clip from a popular Netflix series. Episode #21 of the Speak Up Storytelling podcast is now available for your listening pleasure. On this week’s episode, Elysha Dicks and I talk about finding excellent stories in your everyday life using my strategy "Homework for Life." We discuss how a moment that didn't seem initially storyworthy can prove to be storyworthy with a little consideration. We also receive two outstanding Homework for Life recommendations from listeners. Then we answer a listener question about what we do for a living when not working on Speak Up and our podcast.